I'm not going to lie to you. I have several projects on the needles and really, I had no business dropping them all in favour of something quick and new. Especially when I have more pressing projects in the line up that should have been casted on before this one. Like Brett's sweater. Darn that stupid sweater. And it's only about 4 garter ridges and a buttonhole in. Not enough to even look like anything. But at least I started it, that's all that matters, right? Well, instead of knitting on presents I decided to knit on this (look up and take note of the photo at the beginning of this post...oohh...why did I say that line in my head like I was the Old Spice guy?). Yes, my friends. It's a Jane Richmond pattern. If you remembered from the November Obsessions post I had mentioned that I'm seriously obsessing over her patterns right now. 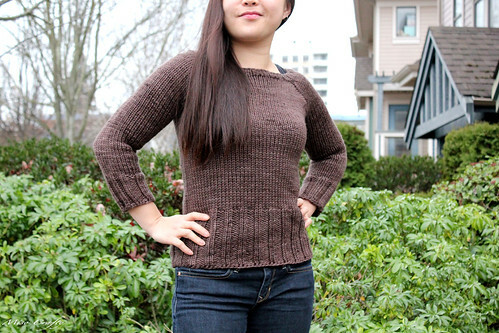 I had been wanting to knit Jane's Oatmeal Pullover since forever but couldn't find the right yarn that I wanted to work with and wasn't too fond of trying to double up yarn to meet the bulky gauge requirements (re: I'm lazy like that). So the second that SweetGeorgia Yarns added the Superwash Chunky to their yarn line up, I knew that this yarn just had to be knit into an Oatmeal Pullover. Both the pattern and the yarn had knit up ridiculously fast. If I wasn't such a fickle knitter and had concentrated on just this project, I'm sure this pullover would have been a weekend knit. Instead, I took days off from it so that I could work on other projects and so that I could sew. I would pick this up again when I was needing something to concentrate on when I wanted to procrastinate on cutting fabric, or I brought this along with me when the Munchkin dragged me into his bedroom so that I could watch him play with his trains (heavens forbid that I touch his trains though! I'm allowed to only watch, not touch...I guess until I learn that I can't keep making the trains kiss the Munchkin). This pattern is by no means a boring knit, it works up way too quickly for you to even gather a thought about it. I seriously had blinked and was surprised that I had to separate the sleeves from the body. Yeah, it's that quick. I'll admit that a quarter of the way into the body I was starting to second guess the whole project. My pullover was looking extremely small and like it could fit the Munchkin. It's times like these that make me so glad that I had bought the extra accessories for my interchangeable needle set, cause instead of putting my live stitches on waste yarn or switching to a circular with a longer cable, I had simply screwed on a cable connector and added another cable so that I could try on the pullover. And you know what? Hallelujah! The pullover, well, what I had so far, fits! Although, I did tink back to the underarms so that I could add a few more stitches. I have "meaty" arms and thought I would need the room (I did) in the sleeves. The entire time I was knitting this up, I was über paranoid that I was going to run out of yarn. I was pleasantly surprised as to how far one skein went - I managed to get to the 3.5" mark into the body from the underarm with the first skein before having to add the second skein (FYI, this is a top down pattern). The pullover was moving along nicely and I had finished the stockinette portion of the body and started on the ribbing before paranoia had set in again and decided to start working on the sleeves before making a decision as to how long I should make the body. I figured once I got the sleeves to a certain point I could gauge how long I could make the body. I managed to cast off the entire project with only 5 grams of yarn left over! That's a mere 6 yards of yarn left unused! I'm pretty happy with the length of both the sleeves and the body and so glad that I didn't need a fifth skein or had to shorten anything. Oh! And can I mention how I joined the skeins? Normally I use the Russian Join method of attaching new yarn but didn't want to use this method this time around because the Superwash Chunky is so bulky. Instead I decided to give Jane's Magic Knot a try. Um...can you say genius?? Pure genius-ness I tell you! I was apprehensive at first cause I have the worst luck when it comes to things that aren't suppose to show, show up for me. Not this time around! I used the Magic Knot to join the skeins throughout this entire project and not once did I have an issue. I urge you all to check out Jane's tutorial on this brilliant technique, which you can see here (scroll all the way down) or here. Seriously, it'll blow your mind and can possibly change how you join new yarn!! Aside from adding a few extra sleeves at the underarm, I didn't do any mods. Ok, I did decreases at the elbows so that the 2x2 ribbing would match up all around and didn't do the decreases called for in the body. But that's it. No actual modifications. I didn't need to. This pattern is perfect as is. I thought I would need to do waist shaping but because of the negative ease I didn't have to. My most favourite part? The negative ease doesn't hug and showcase weird bumps and bulges, like say around your mid section. I'm thoroughly pleased with how this pullover turned out. 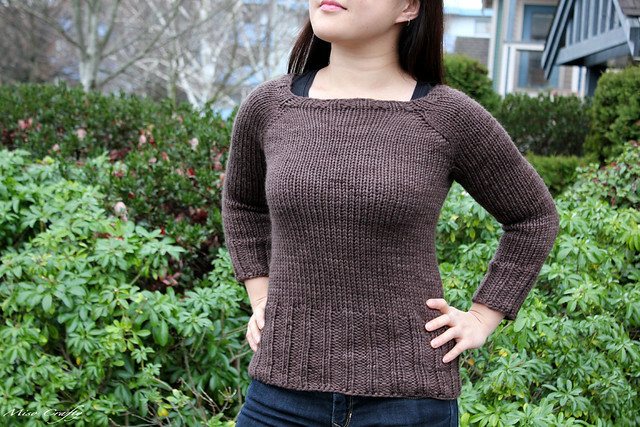 I didn't think I would ever make myself a simple brown pullover, but I absolutely love this shade of brown. My photos look a little washed out (the weather was meh for photo taking) but in real life the brown is actually deep and rich. I think this pullover is a classic staple and can already see a ton of ways to wear it, for different seasons too. After a good soak and a light blocking (yes, I do know how to block lightly. Although I did have to restrain myself from tugging and pulling the crap out of this! ), the pullover is absolutely perfect. And the yarn...oh how the yarn softened up and slightly bloomed a bit. The entire pullover now feels like a perpetual cuddly hug and I have to refrain from wrapping my arms around myself, lest I look like an asylum escapee! This pullover has already gotten plenty of wear ever since it came off the blocking mats. It's in some serious rotation with my newest Owls sweater and Georgia cardigan. I swear, I really do have other clothing and other sweaters. It's just that this cold weather is making me crave nothing but comfy pullovers...and how could I not wear yummy MCN that Georgia is made out of?? My craving is wanting me to knit even more pullovers. Really. I'm already planning on knitting another Oatmeal. I got the yarn lined up and ready to go but promised myself that I couldn't cast on until Brett's sweater is almost finished. 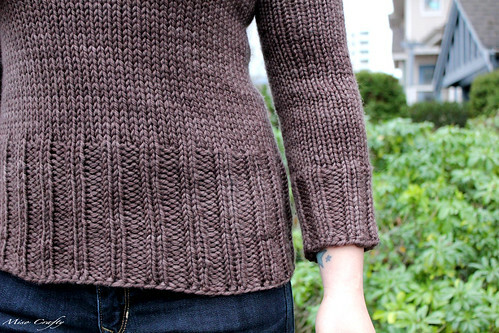 But definitely know that you'll be seeing a few more Oatmeal Pullovers on this here blog in the future! I have resigned myself to not knitting garments for me. They never work out and I never end up wearing them. I think from now on I will just make myself scarves and beanies. I always wear those! I can't wait to have kids though so I can knit some cute little cardis for them. It's even more gorgeous than I imagined! I love the way it fits you, it's so flattering. I would love to see this in person just to admire the SGYs chunky, I bet it's to die for! You are seriously tempting me to knit more pullovers! Thank you sweetie for such lovely compliments! :) This cold winter is definitely making me knit faster, I have yet been able to quench this craving for comfy pullovers!